New images from Rocketman feature Taron Egerton's radical transformation into Elton John. The biopic about John is scheduled to hit theaters on May 31st and the promotional campaign is starting to roll again after the first teaser for the movie was released back in October. Hopefully, this means that a full trailer is on its way, now that Bohemian Rhapsody is preparing to hit Blu-ray and digital services. We've all heard of Freddy vs. Jason, but it looks like a new battle is coming later this year with Freddie vs. Elton. One of the new images from Rocketman shows Taron Egerton as Elton John during his now-legendary 1975 performance at Dodger Stadium in Los Angeles. Egerton can be seen wearing a sparkly Dodgers uniform, just like the one that John wore during the performance, a look that has been copied too many times to count since then. John was able to sell out two nights in a row, performing to over 100,000 people in what became his career-defining performances, playing for over 3 hours and setting the bar extremely high for all that followed. The next shot from Rocketman features a young version of Taron Egerton's Elton John sitting at a piano, singing into a microphone in a recording studio. This is a few steps back from the triumphant Dodger Stadium gigs, but shows how he got there. Before the stadiums, John was delivering number one records and hit singles, building into one of the biggest popstars in history. It's going to be very interesting to see how they are able to pull off the ups and downs of Elton John's personal and professional life on the big screen, especially since the musician is still alive to give notes on the project. 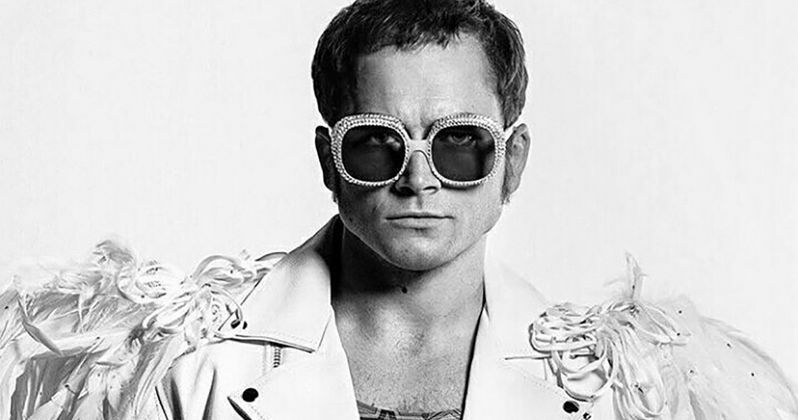 The final image from the latest Rocketman images shows off Taron Egerton in full late 1970s Elton John rock star mode. A custom white leather jacket, sparky glasses and a shirt with a plunging neckline. John was on top of the world at this point and the drugs and groupies were flowing, which one can almost see on Egerton's face. The only complaint here is that the star clearly has less chest hair than Elton John did at this particular time in his career, and slightly more hair on his head. With the massive success of Bohemian Rhapsody, Rocketman is going to have some added pressure when it hits theaters later this year. Rami Malek's portrayal of Freddie Mercury has been widely praised, which helped the movie become the highest grossing music biopic of all time. As of this writing, the biopic has made over $714.4 million, which is something that has shocked everybody involved in the project, including Queen guitarist Brian May. However, Rocketman will put the focus on one artist, as opposed to the band dynamic, and will hopefully benefit from having access to the source, since Elton John is still alive. You can check out the Rocketman images below, thanks to the Rocketman Twitter account.